1. Comfort Water- Comfort water is a great tactic for coffee, tea drinkers. Replace your cup of normal tea with a hot glass of herbal tea; squeeze in some lime for flavor. Hot herbal tea will help you meet your quota of water and will also give you your daily dose of antioxidants. 2. Personalize your Water Bottle- Splurge on a perfect reusable bottle. Buy the one with your favorite color and design as the more you bond with your bottle, the less likely you're too loose it. Put up an inspirational sticker or image onto it. Now you are ready to drink water from it throughout the day. Don't forget to refill you're bottle as soon as it is empty. 3. 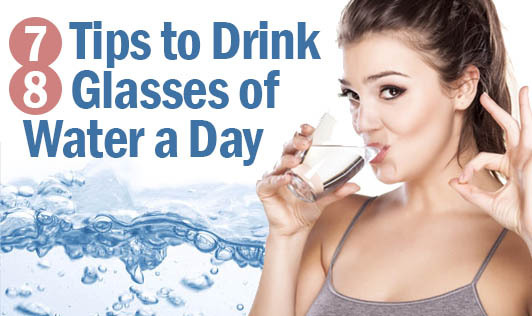 Sip Up- Gulping down all that water can be daunting. So get a packet of straws to slowly sip it instead. You can even pick up a sipper bottle with a built-in straw. 4. Drink & Drive- Not Alcohol! Keep a water bottle in your car, so that whenever you are driving around, you can easily reach out for your bottle and sip some water. You can also think of some other places to stash some water bottles like next to your couch, in your bag, on your desk so that you easily drink water from time to time. 5. Experiment with Different Kinds- Try the different kinds of water available at stores, like sparkling, spring, vitamin-enhanced, fruit-flavored, herb-flavored, and more. However make sure you read the nutrition label as this type of water may have a significant amount of calories added to it. 6. Set a Glass of Water on your Dinner Table- Keep a glass of water on your dinner table just like they do in restaurants. Don't be scared to have it while you're eating. Drinking water in between every few bites will not only slow you down and keep you full but also help you in meeting your water needs. 7. Combine Habits- Inculcate the habit of drinking water while you're doing your other routine things. Examples: If you're working out in the gym, carry a bottle along. When you are getting ready for bed, place a glass of water on the night-side table. Sip on some herbal tea while reading. In short, develop water habits that gel with your routine. Follow a couple of these tricks, and you can reach your 8-glass finish line almost effortlessly!